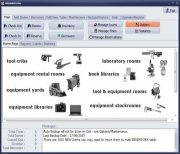 Handy Equipment Tool Manager for Windows, Buy License Upgrade. Purchase at our secure store 24 hours a day, 7 days a week. Select support and/or multi-user, multi-computer, or network license.